MEAT ME AT THE BAR Cathy and Pete Seghesio broaden their legacy with new butcher shop and salumeria. 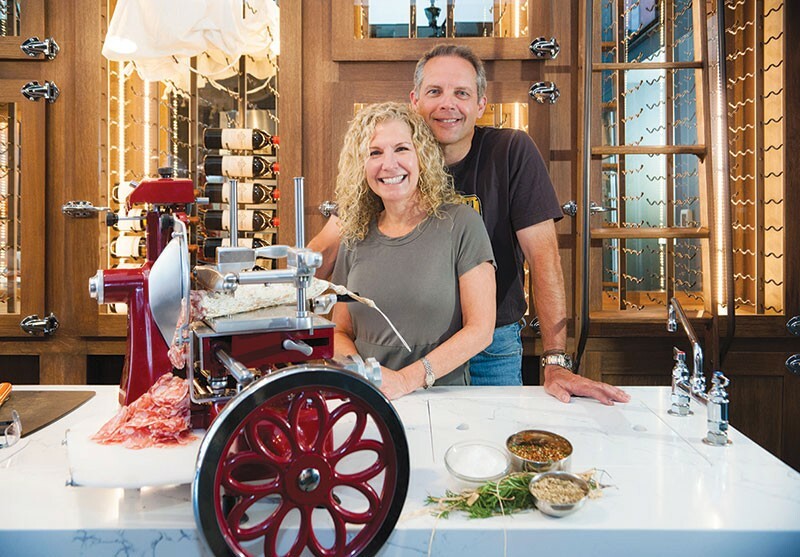 After five years of planning, delays and a whole lot of work, Pete and Cathy Seghesio opened Journeyman Meat Co. this month, a long-anticipated salumeria, butcher shop and wine bar located on the site of Healdsburg's old post office. The small, gray-and-red-accented shop is dominated by the gleaming, Ferrari-red Berkel meat slicers that artfully shave cuts of the sublime, housemade salume. A glowing, wood-fired oven produces tangy thin crust pizzas ($15), roasted sausage skewers from Seghesio family recipes ($24) and petit, three-ounce steaks served with Parmigiano-Reggiano cheese and grilled bread ($18). On the kitchen wall above the day's specials is an illustration of different cuts of beef listed in Italian and English. Rosetta is a sirloin tip. Costata is ribeye. The terms sound so much more delicious in Italian, no? There are a few seats at the counter and a dozen or so more in front of the massive wall hanging shaped like a pig. "It's kind of a meat bar," says Pete Seghesio. "That's what we were looking for." Indeed, customers can belly up for a taste of the six kinds of salume paired with a glass or two of wine. Two wines and salumi goes for $15; four wines with seven salumi is $28. The small but exciting wine list reads like an old family photo album. Each wine is made by friends or family and has a story detailed on the wine list. The Center Street shop is the public face of the meat enterprise, but there's more to it than meets the eye. The Seghesios are opening a USDA-certified production facility in Cloverdale, where meat will be made into salume for Journeyman and other producers. Journeyman's beef comes from its own herd of Wagyu and Angus cattle. Pork comes from Llano Seco in Chico. Journeyman has a dream team of butchers. Chef and general manager Gillian Tyrnauer is a multitalented cook's cook whose résumé includes Healdsburg Shed, Ramen Gaijin and Oakland's Oliveto. Samueli Grigio trained under famed Tuscan butcher Dario Cecchini, and Crystal Waters has a Ph.D. in meat science. Seghesio is no slouch himself. He also trained under Cecchini, as well as a famed salume maker in Florence. Seghesio's roots in Sonoma County run deep. His grandfather, Edoardo Seghesio, emigrated from Piedmont, Italy, in 1883 to work for the Italian Swiss Colony in Asti, at one time the largest wine producer in California. In 1895, Edoardo purchased a home on 56 acres in the Alexander Valley, and made his first Zinfandel in 1902. He later went on to found Seghesio Family Vineyards, which Pete ran from 1987 to 2011, when the family sold the winery to Crimson Wine Group. Together with his teen sons, Will and Joe, who also work at Journeyman, Seghesio makes two wines under the Journeyman and San Lorenzo labels. The San Lorenzo wines are made from a vineyard purchased by Seghesio's great grandfather in 1896. The 2015 San Lorenzo "Rock Garden" ($48) is an elegant and velvety Zinfandel, while the 2015 "Pearl" ($70) is a juicy but complex and long-finishing old vine red blend. A visit to Journeyman feels like being invited into a Seghesio family reunion, where the sense of history and great food and wine flow freely. Well, at least the history is free. Journeyman Meat Co., 404 Center St., Healdsburg. 707.395.6328.